These photographs first appeared May 30, 2000. When this 1972 Sakonnet 16 took to the highway, she travelled all the way to Cody, Wyoming! Arizonian Jim Teece just bought her and is looking forward to restoring all that interior mahogany. A 135 HP Johnson on the transom has probably propelled her to some western speed records. Right now the boat's in Montana; a couple of more states and she'll have the whole Mountain Time Zone covered! Note the reversible pilot seat and the white rub rail. 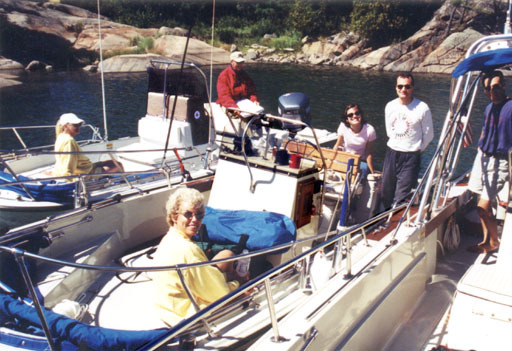 From Byng Inlet, along the small craft route of the eastern shore of Georgian Bay, through narrow and named passages like "Dorés Run", to the offshore Bustard Islands, this group of three Boston Whaler Outrages cruised north together, stopping for lunch in this little cove. On the left is the Gibson's 1992 19 Outrage II; in the center the Goltz 18 Outrage; and on the right WHALE LURE, the Goltz 25 Outrage. We used to go the Bustards in our sailboat, but it took most of a day of sailing from Little Current. These guys were back down in Parry Sound for dinner that same night! One great feature of Classic Boston Whaler boats is the sophisticated canvas designs available from Wm. J. Mills & Co. With the addition of the full set of canvas, you can completely enclose an open boat like an Outrage, turning it into a weekend cruiser. Larry Goltz has done just that with WHALE LURE, and he often overnights on it while cruising in the North Channel. 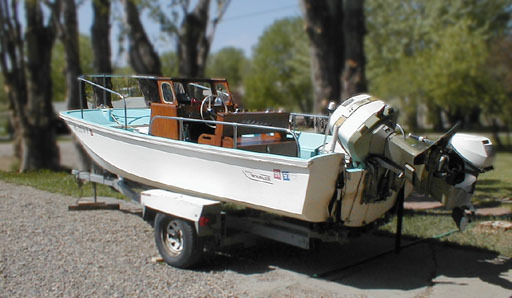 The advantage of the canvas is that it makes the boat very adaptable. 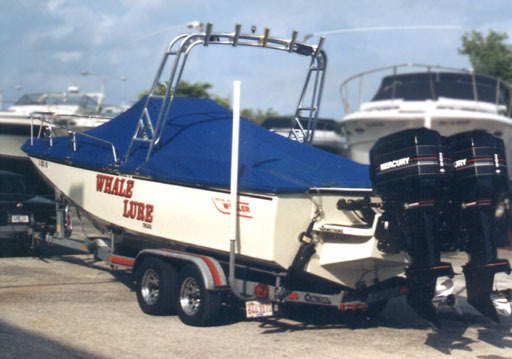 You can have a completely open boat for warm weather fishing, or a completely closed boat for foul weather cruising. 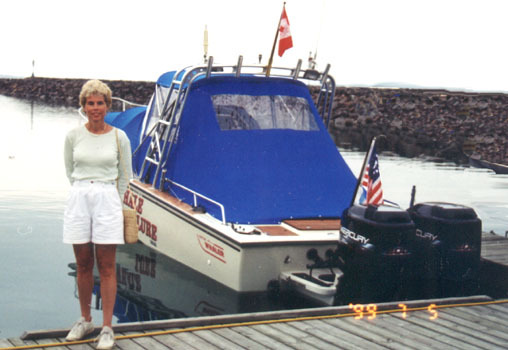 Not to ignore Lynn--who looks like she's having a grand time cruising the North Channel--but this photo shows the boat with most of the canvas set: Forward Shelter, Flying Top, Windshield, Side Curtains, and Aft Curtain. That hazy sky turned into a big storm, but under the well maintained and waterproofed Mills & Co. canvas, the cockpit was completely dry. As any boater knows, that is hard to do sometimes even with fiberglass overhead! Location is Hilton Beach, St. Joseph Island, Ontario, in the North Channel. Rounding out the full set of canvas is the Mooring Cover, which can also used when trailering, although Larry generally removes it while on the highway. On a rainy 4th of July weekend in Blind River on Huron's north shore, Larry has removed the side curtains and aft curtain. With Flying Top, Forward Shelter, and Windshield set, he is ready for departure in cool, wet conditions. You can also get a sense of the cozy sleeping compartment in the bow, where the 25 Outrage has a large level area on which RV-style matresses are deployed for overnight accommodations. And the radar arch, when not bristling with fishing rods, make a great place to dry out your towels. Coming to Whalering and trailer boating from a sailing background, I have to confess that at first I thought all those bracketed outboard motor mounts were something of an affectation. I didn't understand how moving your engine behind the boat improves performance. It also improves the interior of the boat, too. 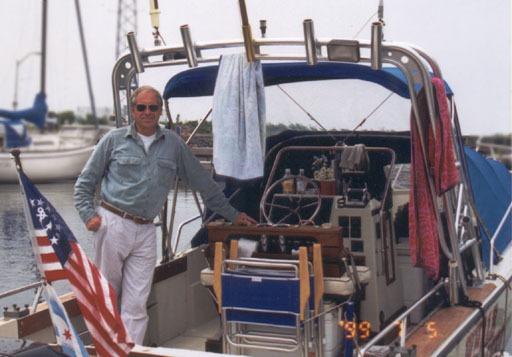 On larger Boston Whalers a full transom is an option, moving the outboards to a stern bracket. This really opens up room in the rear of the cockit on WHALE LURE. The motor well becomes a nice closed locker for storage. 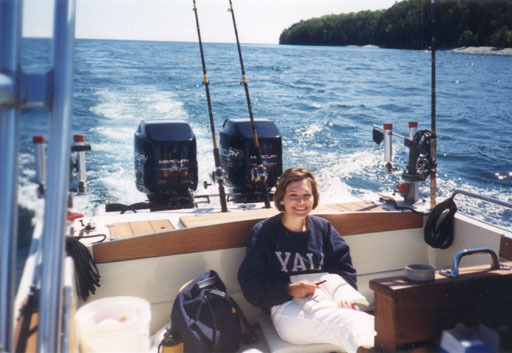 We see in daughter Lauren's smile that she is enjoying the space while on a cruise past Rock Island in northern Door County, Wisconsin.